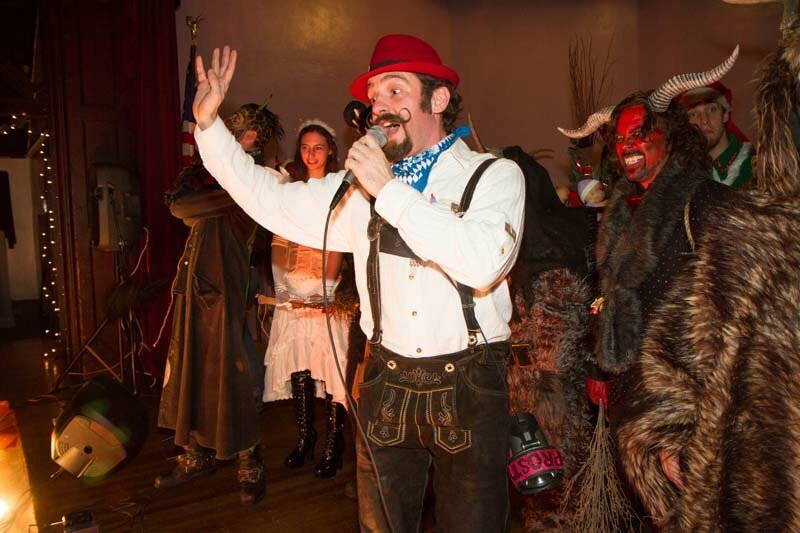 Photos appear courtesy of Paul Koudounaris, Paul Navaerz, Phil Glau, Randall Mills, Stephanie Antonio, and Jon Alloway. 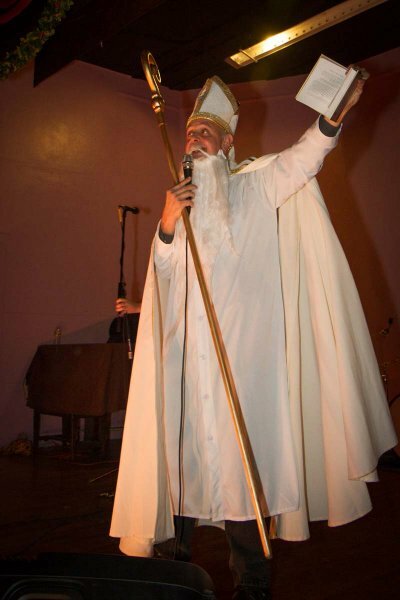 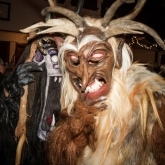 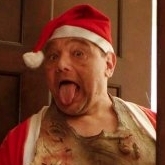 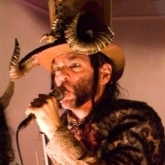 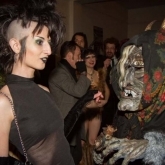 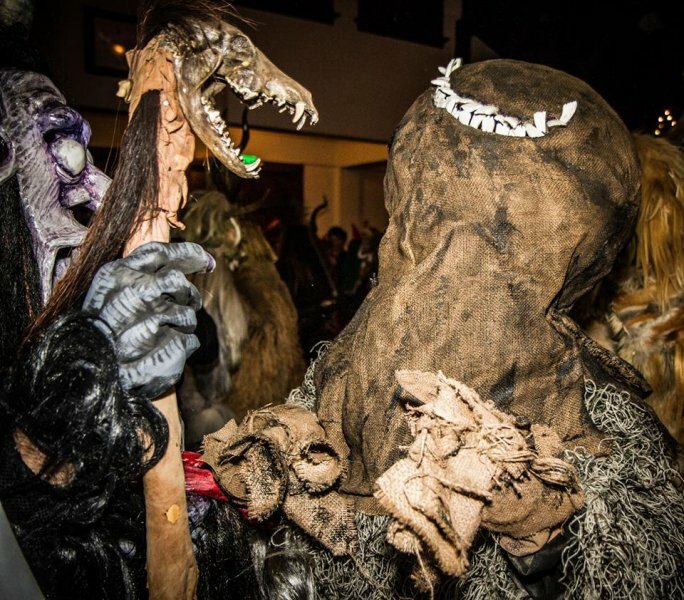 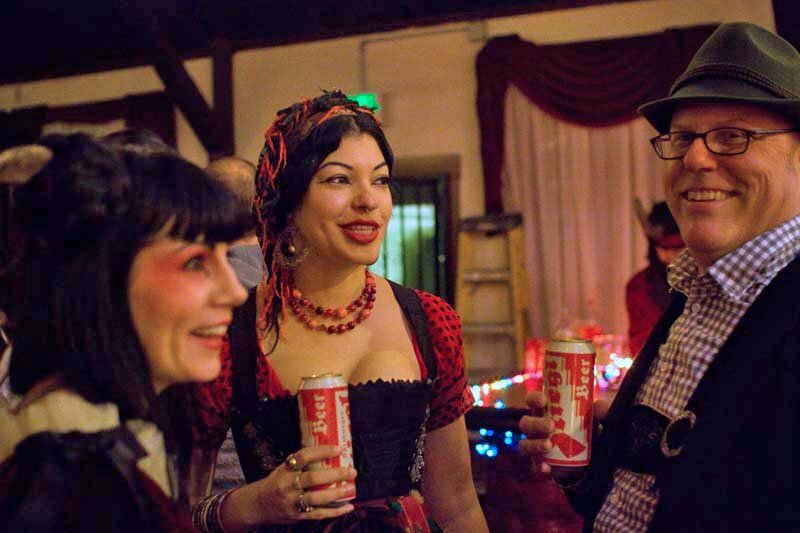 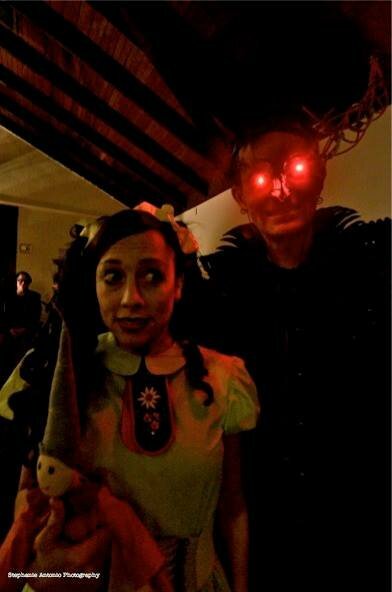 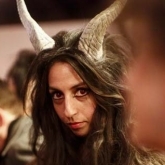 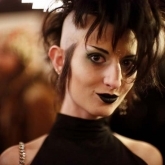 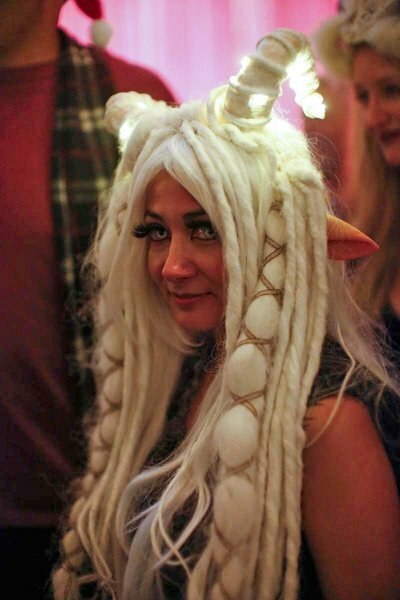 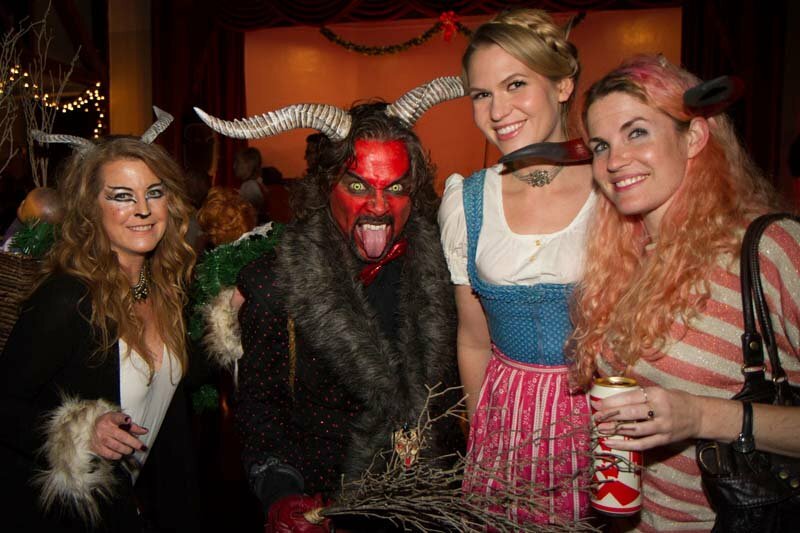 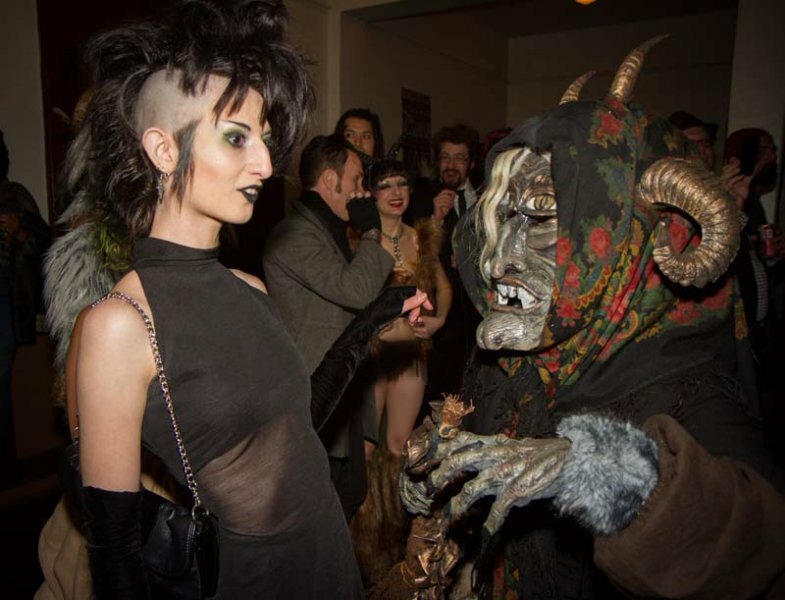 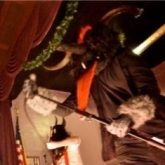 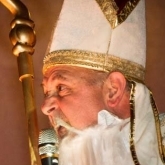 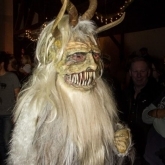 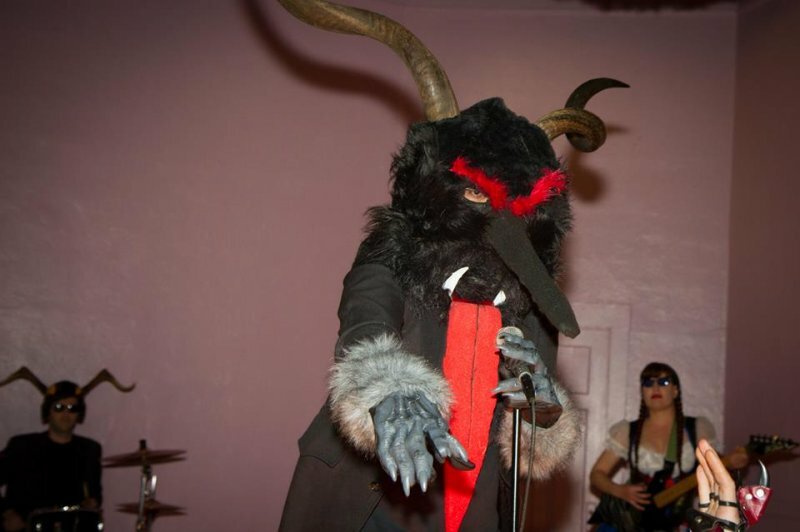 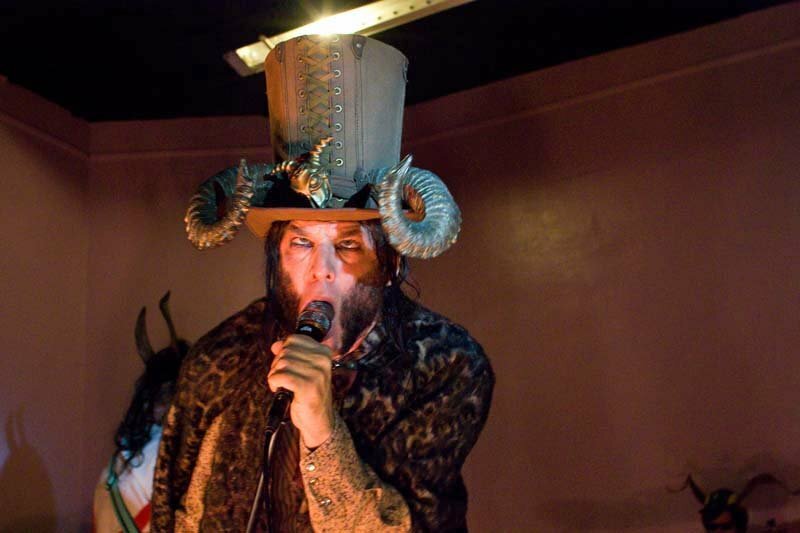 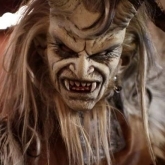 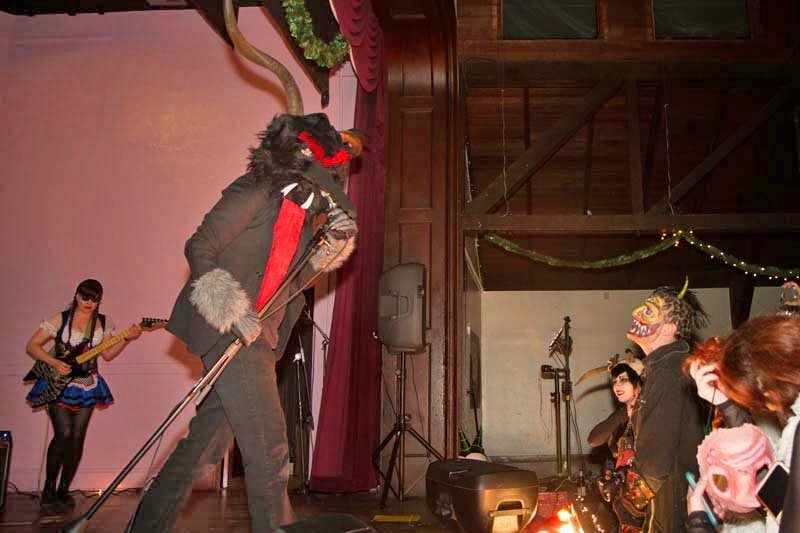 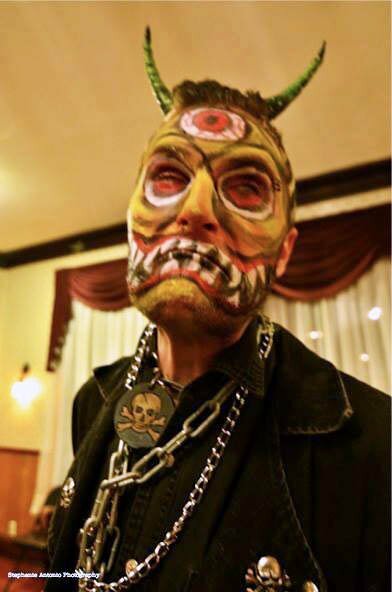 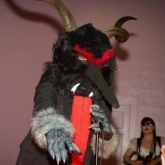 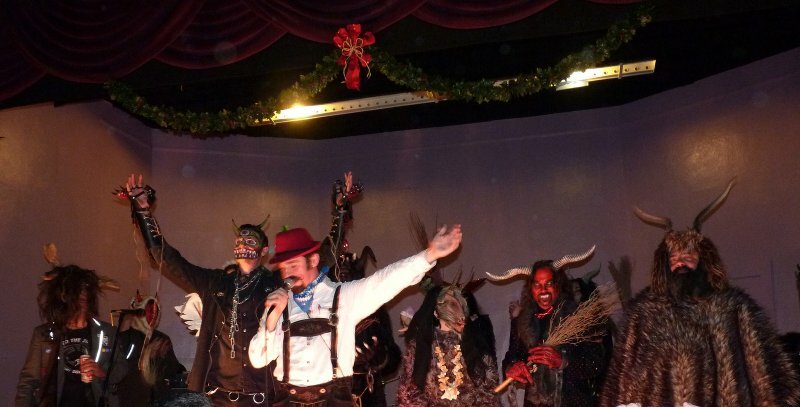 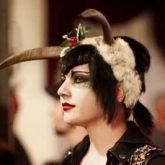 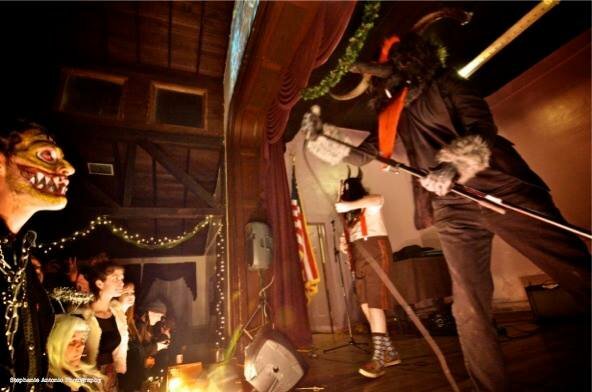 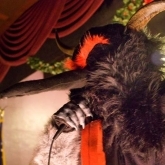 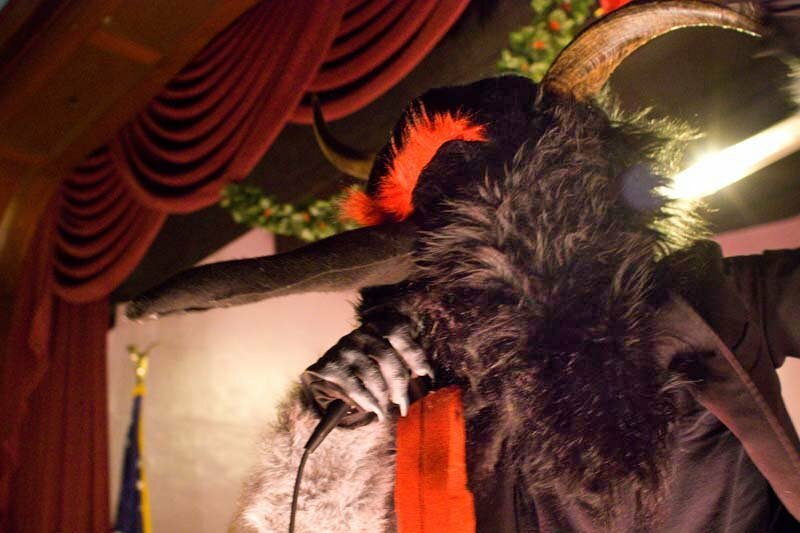 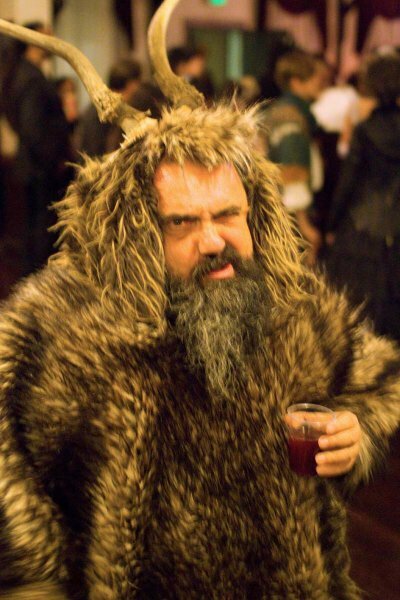 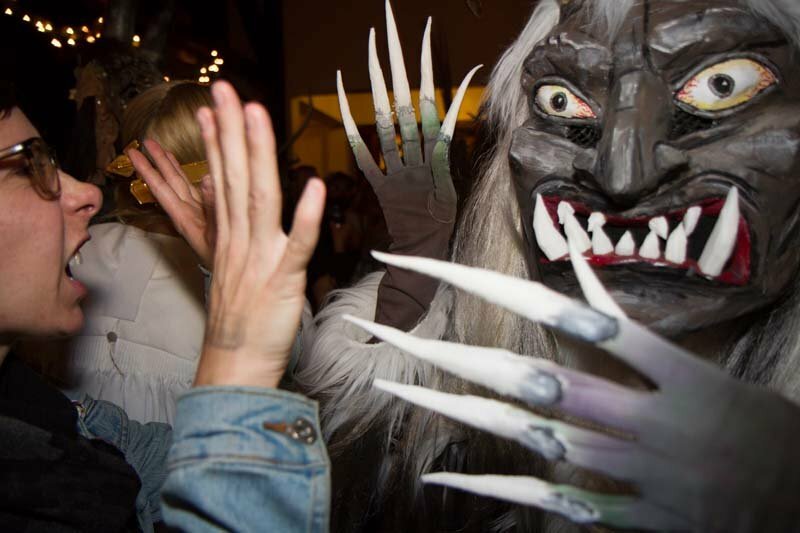 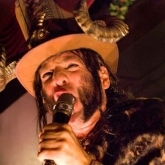 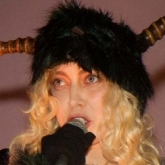 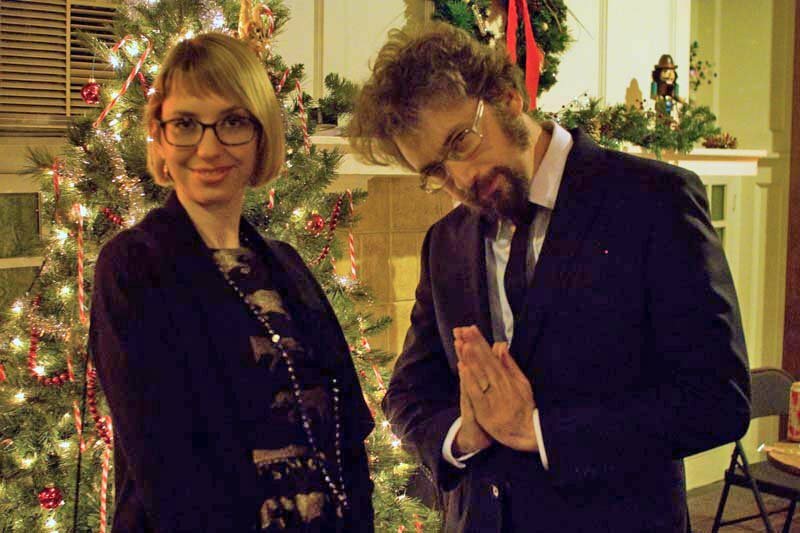 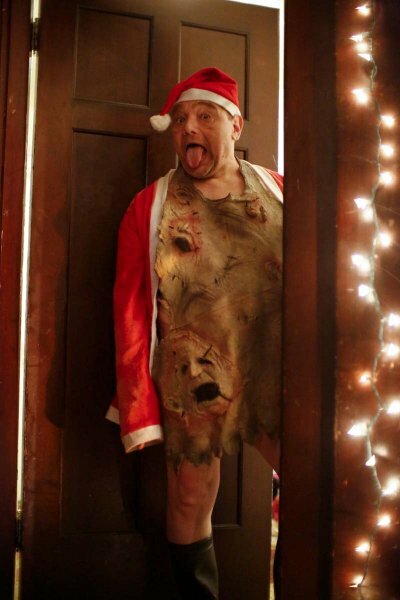 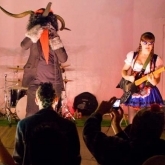 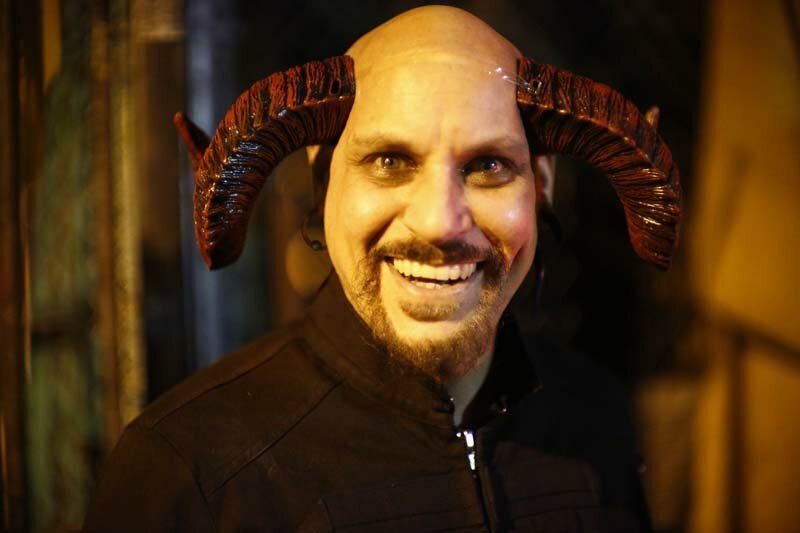 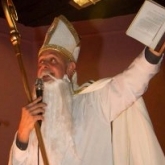 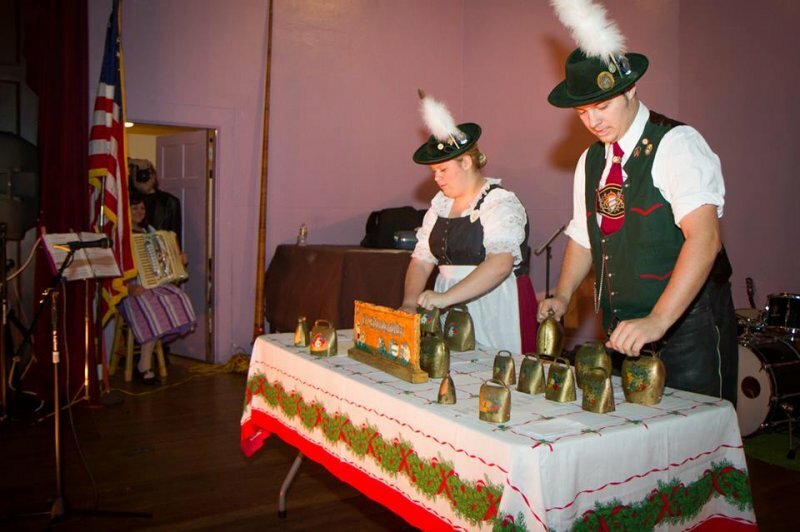 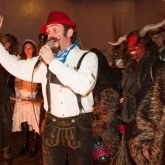 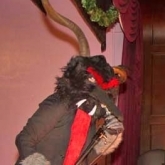 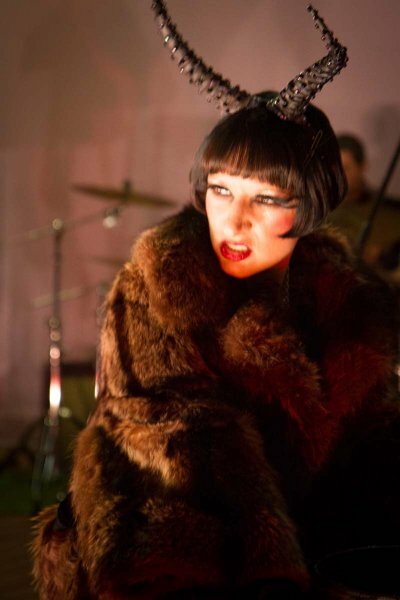 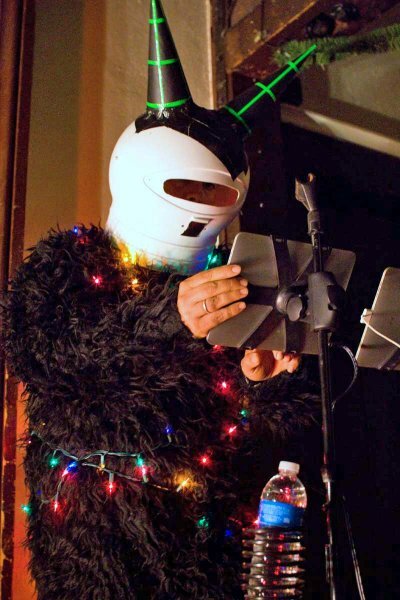 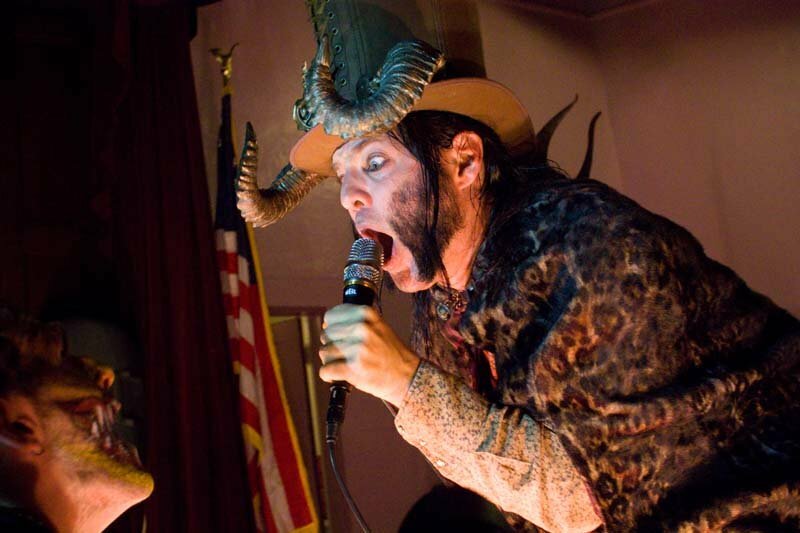 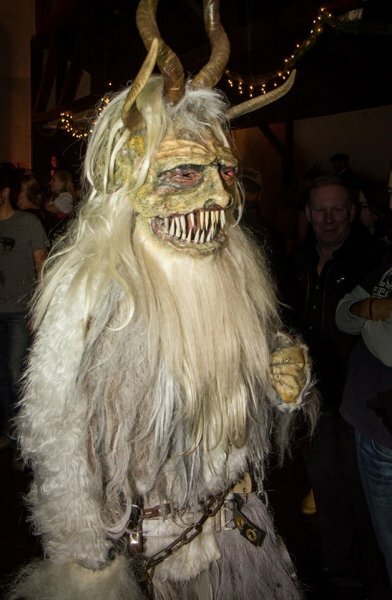 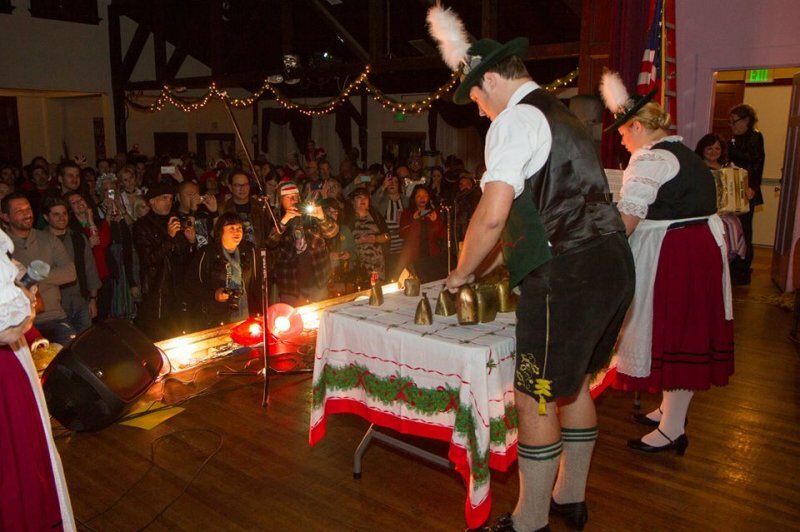 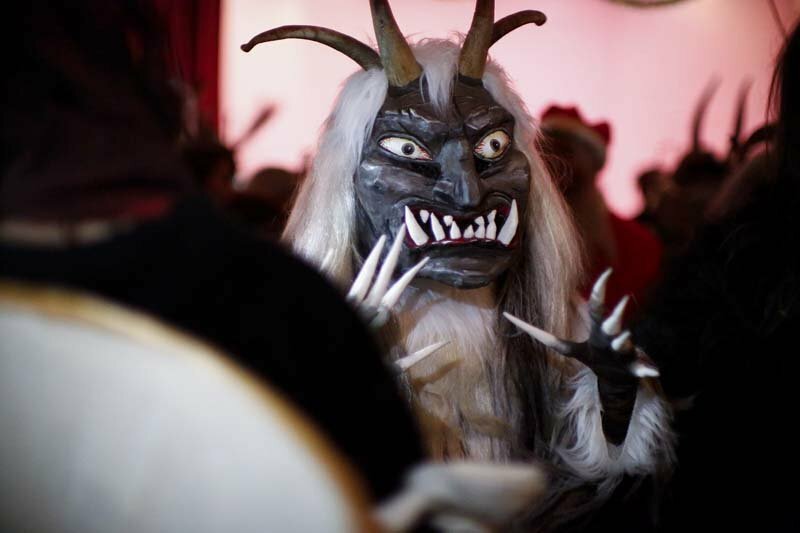 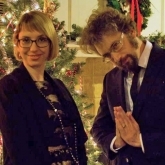 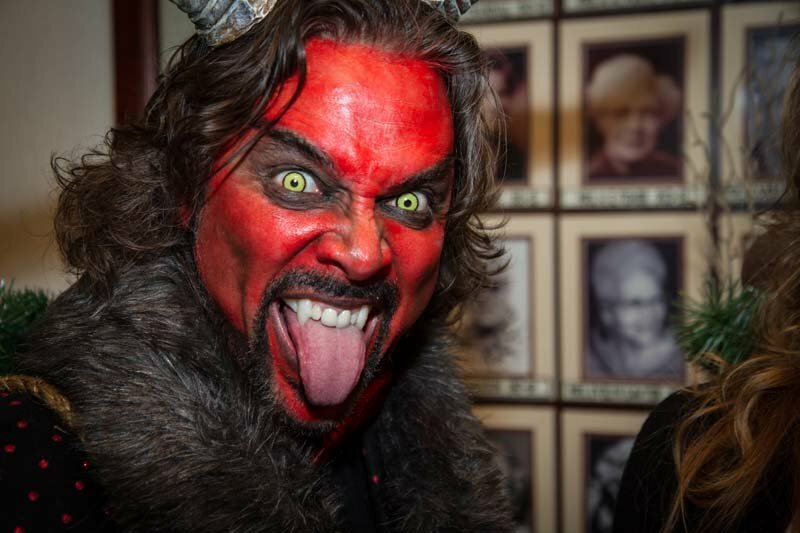 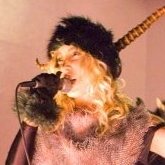 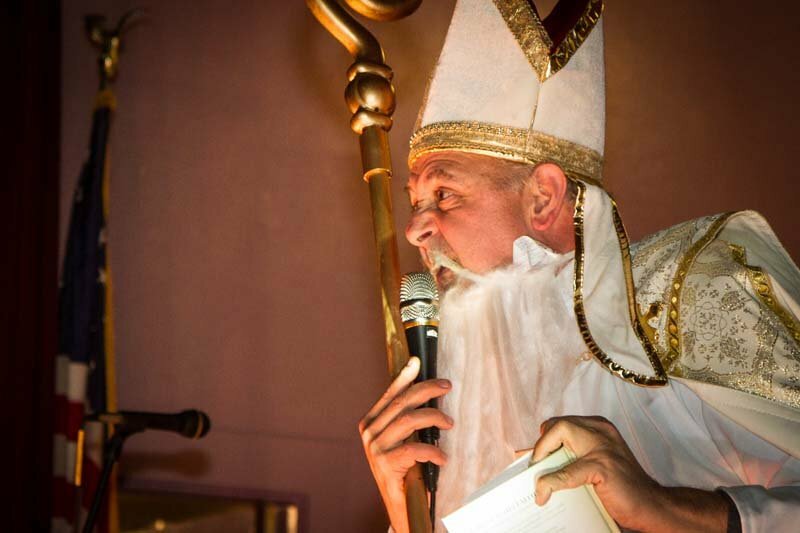 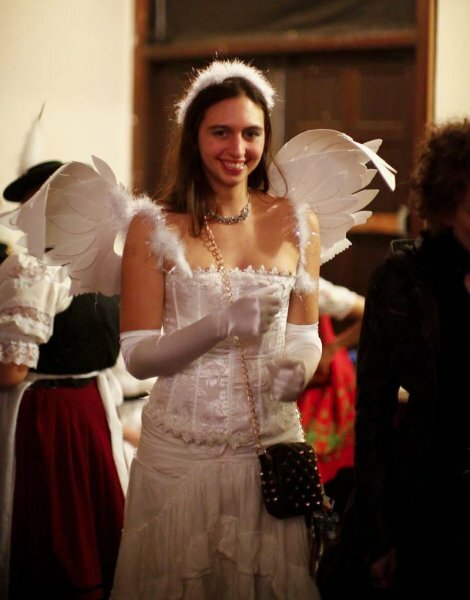 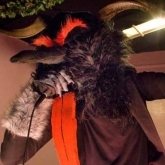 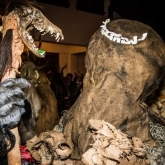 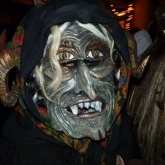 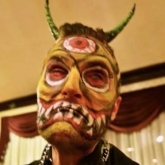 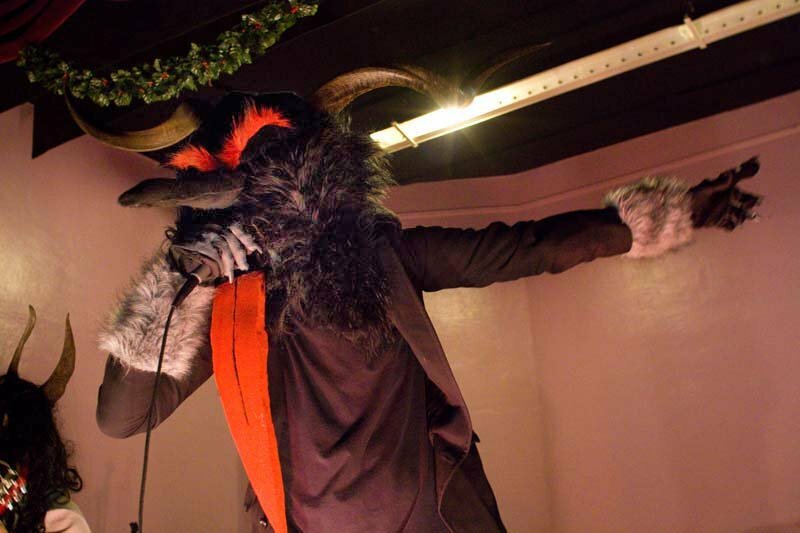 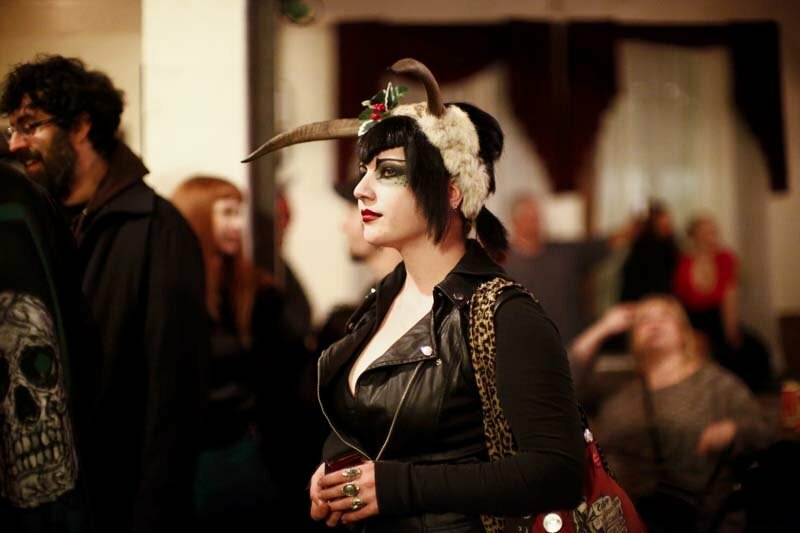 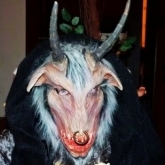 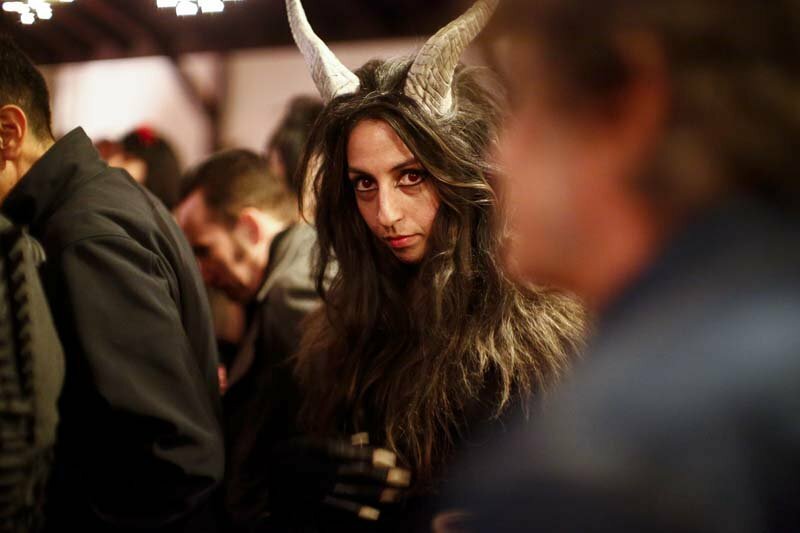 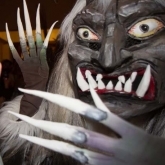 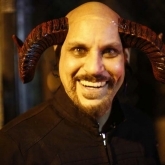 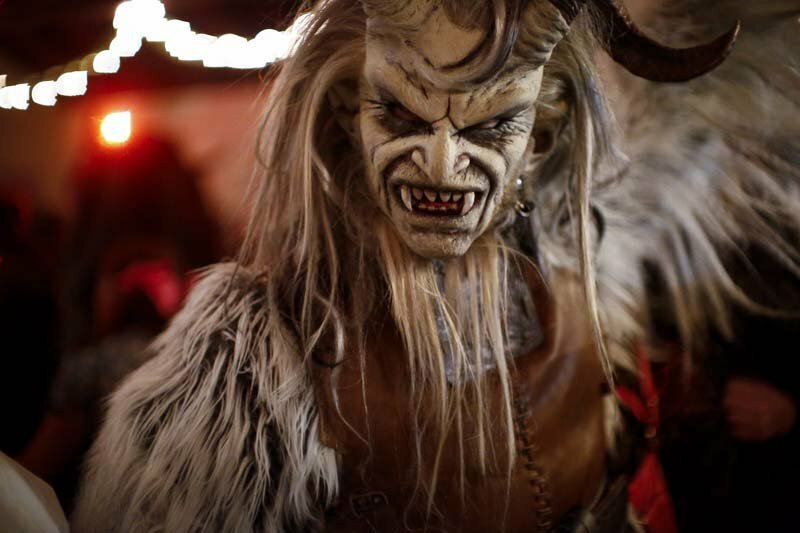 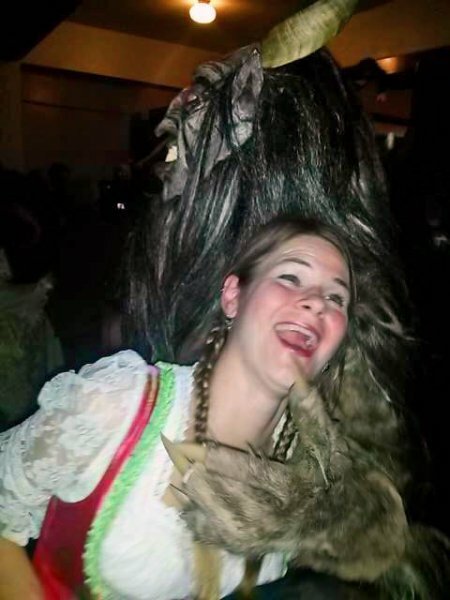 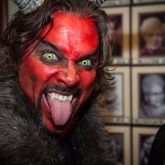 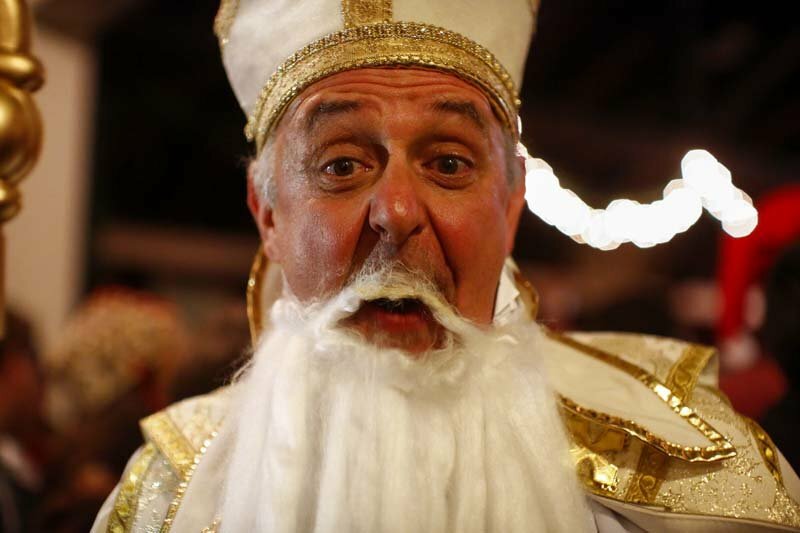 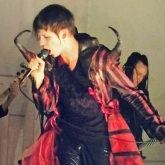 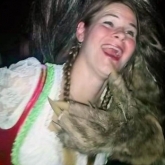 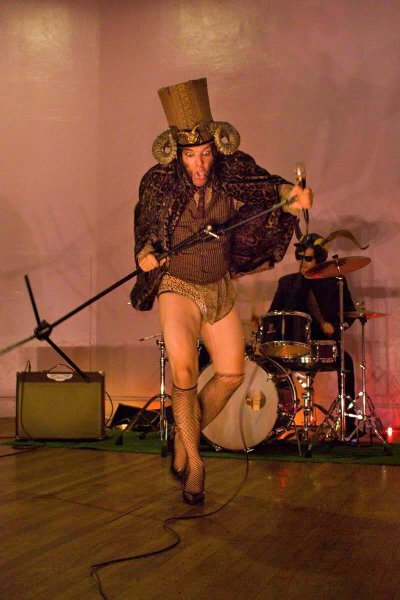 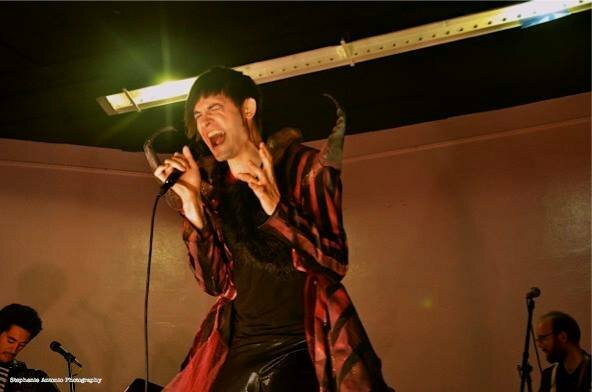 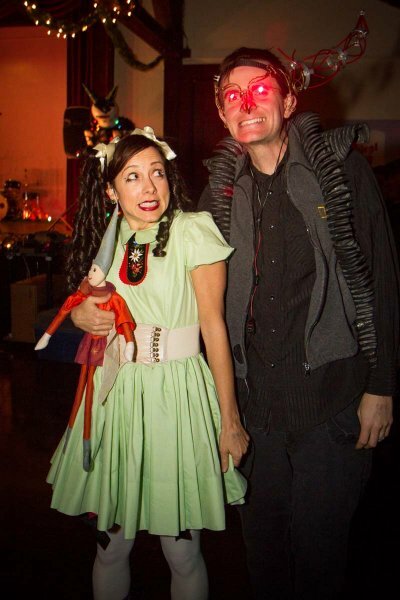 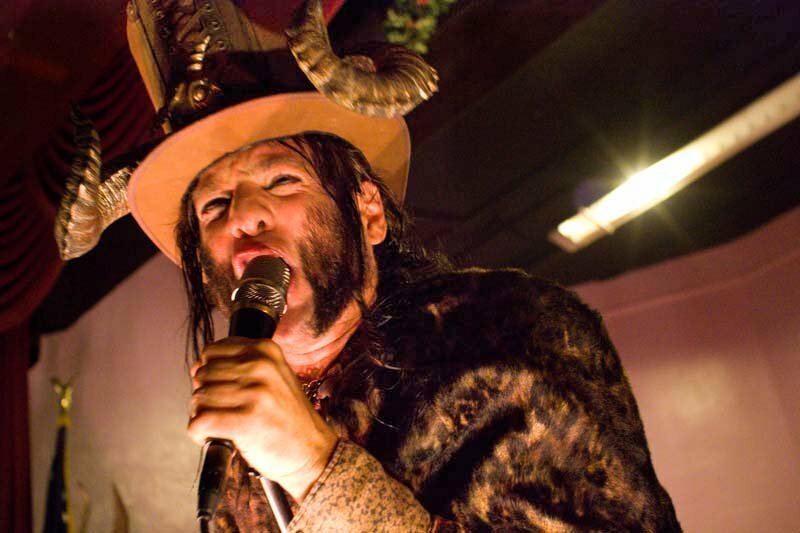 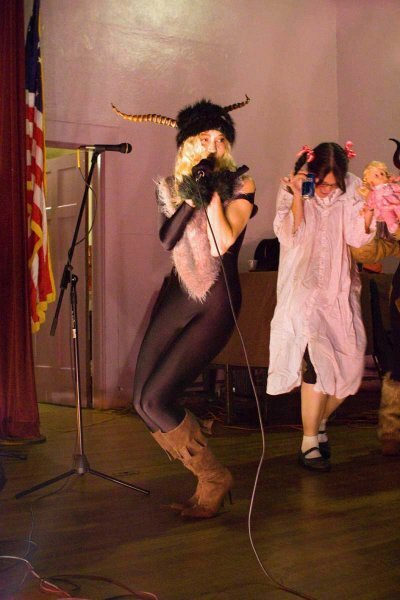 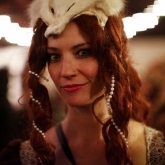 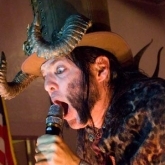 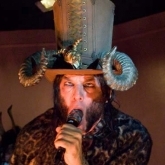 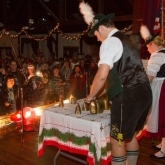 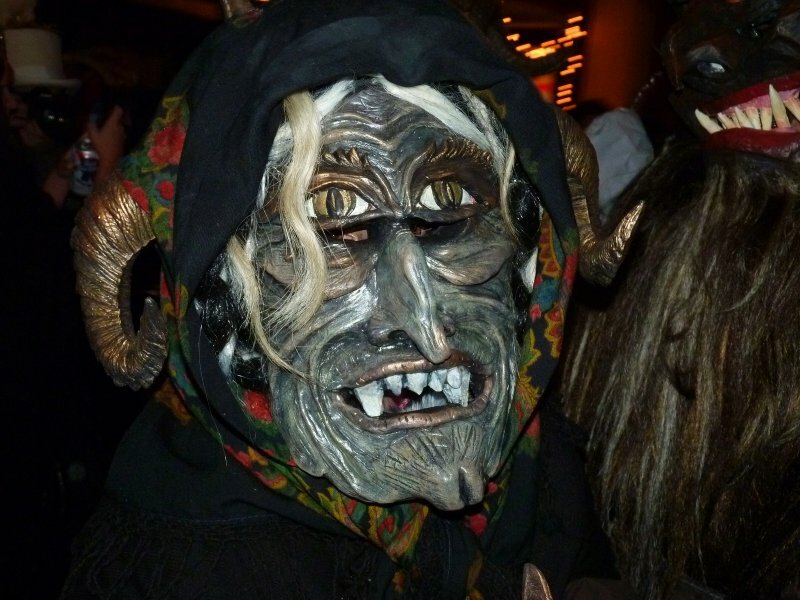 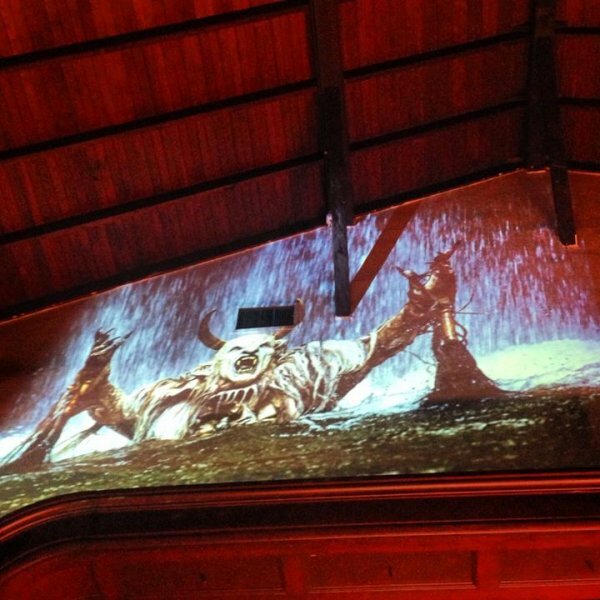 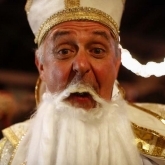 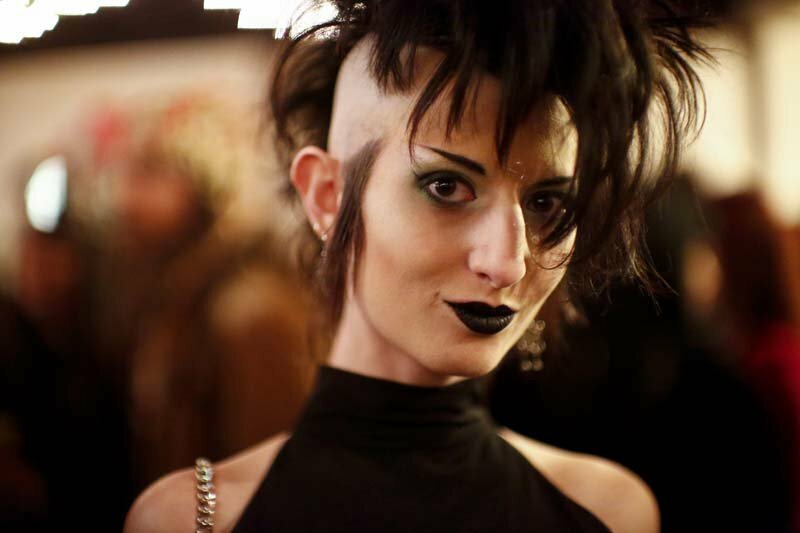 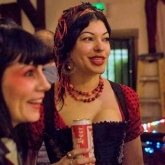 THE KRAMPUS BALL kicked off the Los Angeles Krampusfest on December 7, 2013. 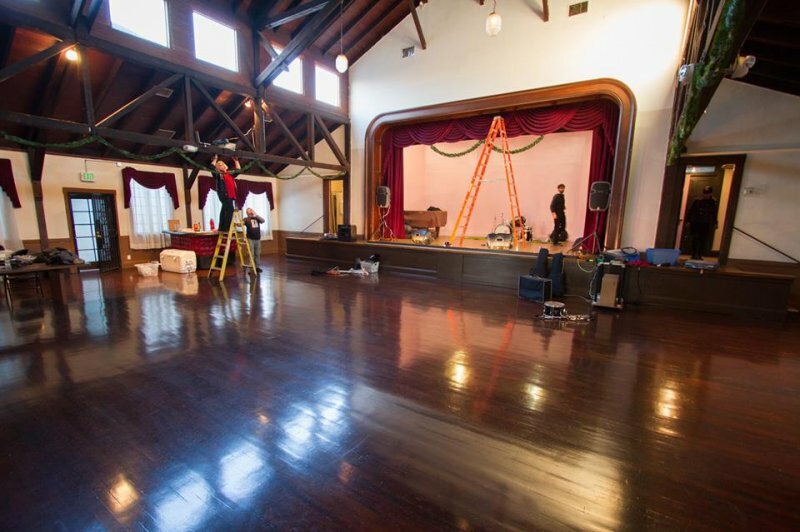 An explosion of advance online sales, caused us to move the event to a new venue only days before the show. 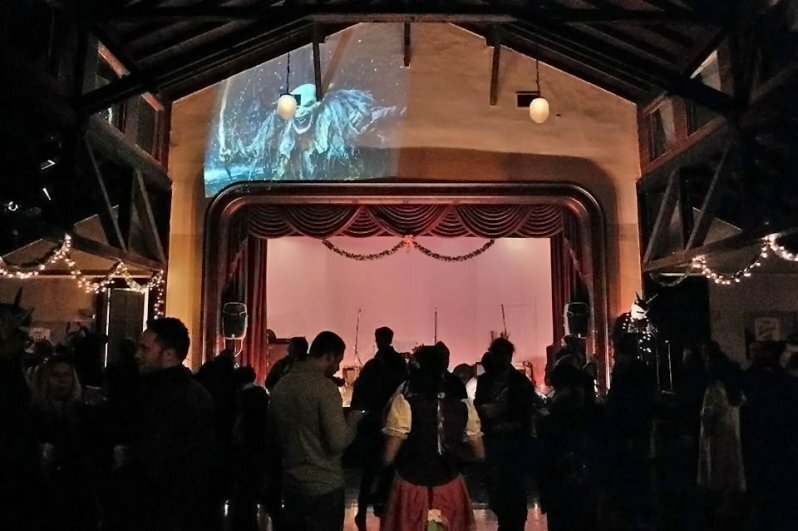 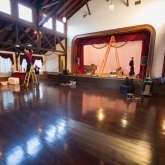 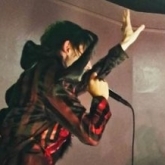 The new location, the Highland Park Ebell Club, had the added advantage of also offering surprisingly appropriate alpine chalet-like interior, and on the night of the show that venue was also quickly filled to capacity shortly after doors. 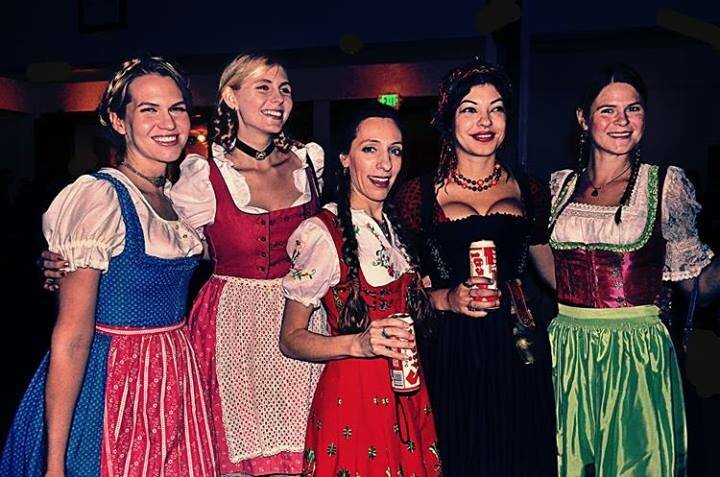 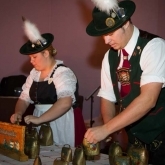 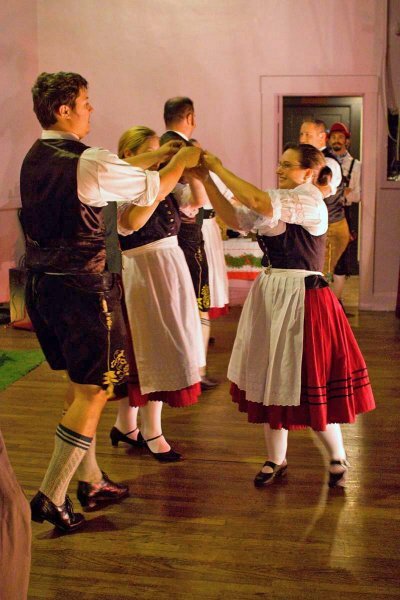 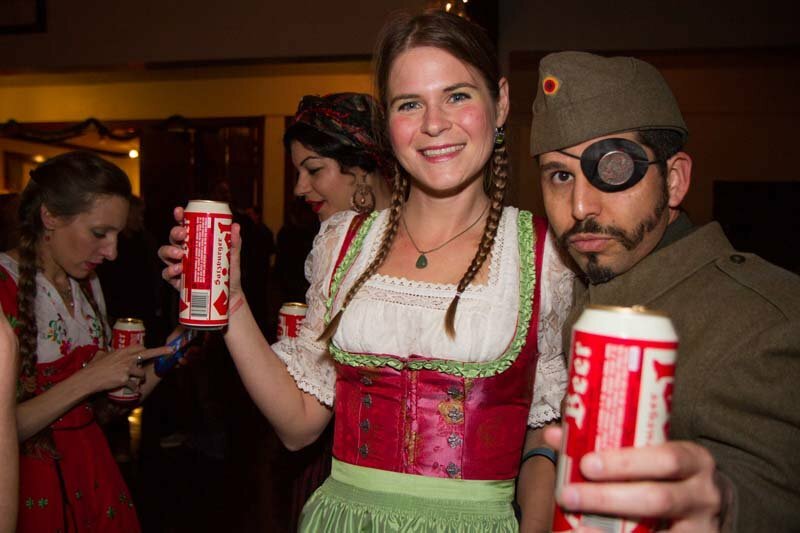 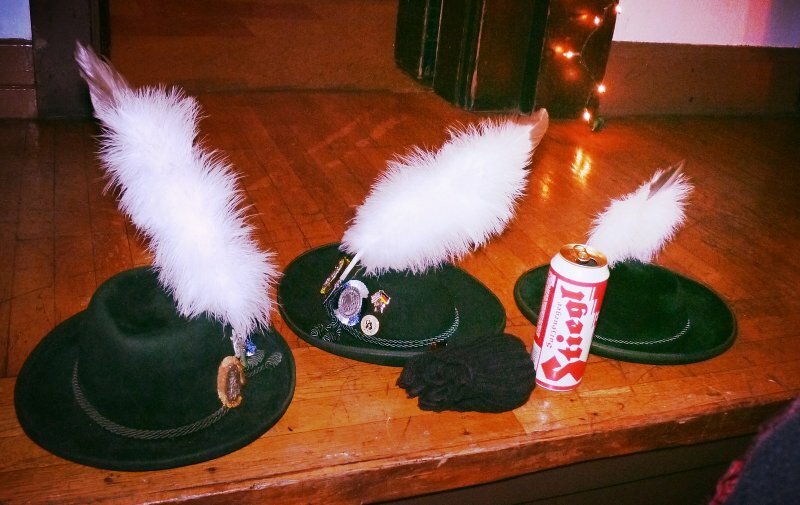 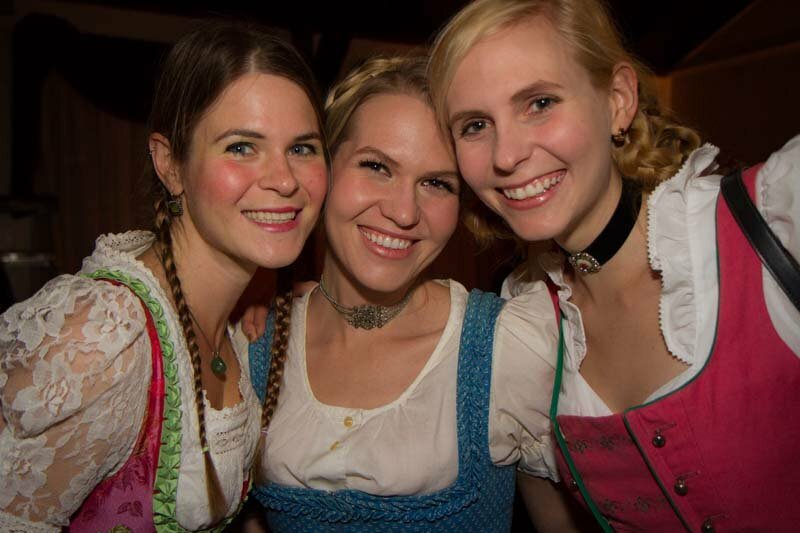 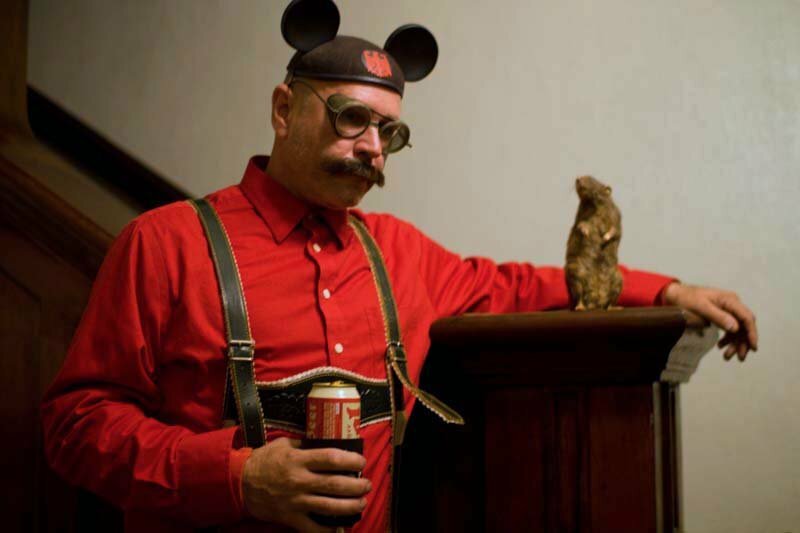 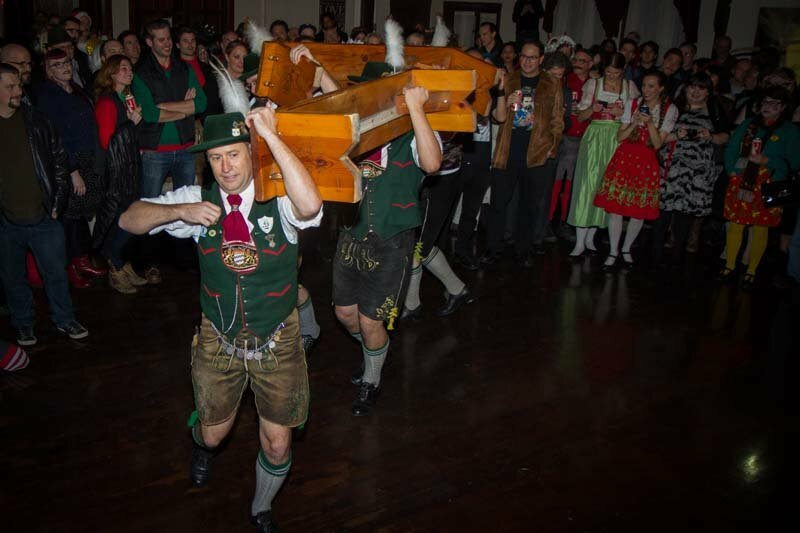 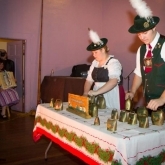 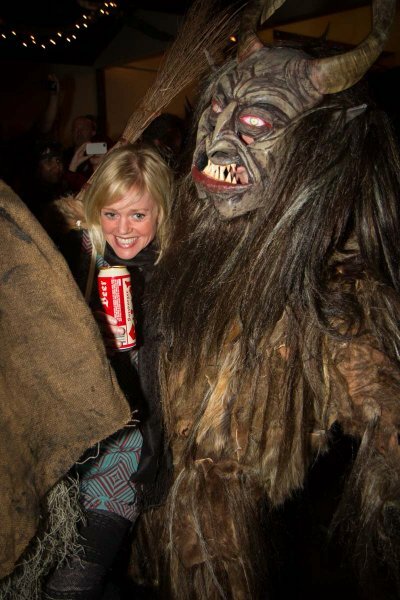 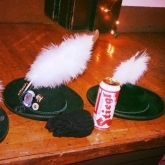 Throngs of fantastically costumed guests enjoyed photo ops, Christmas cookies, and a bar serving Austria’s beloved Stiegl beer. 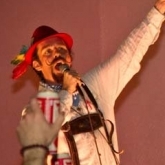 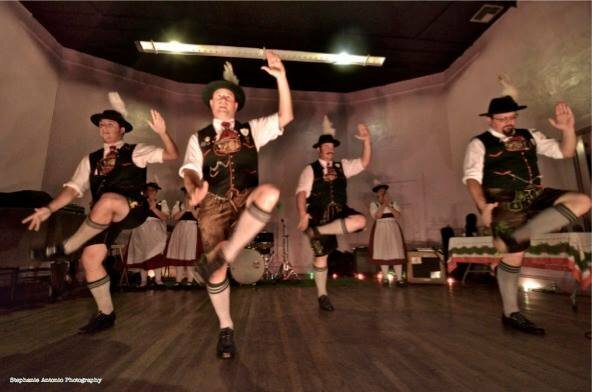 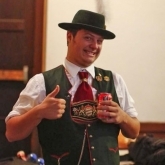 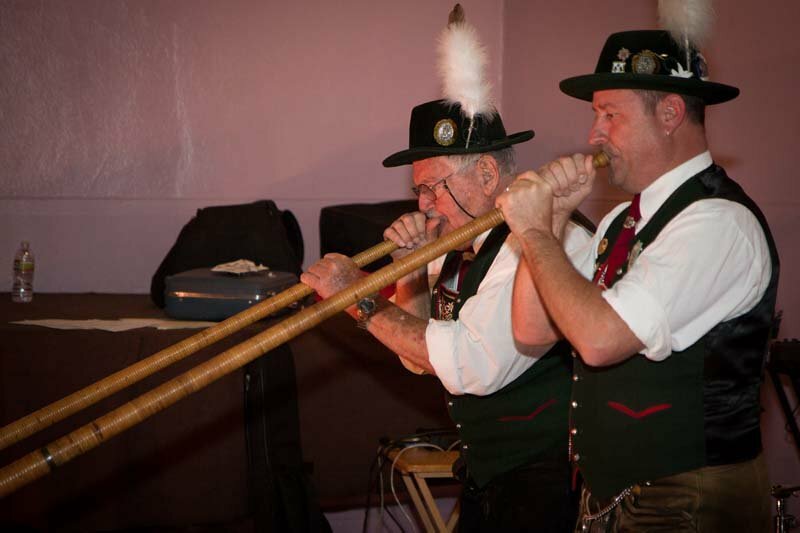 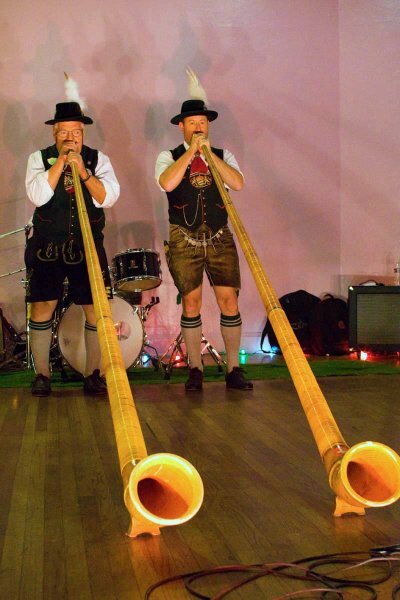 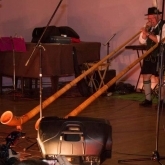 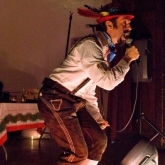 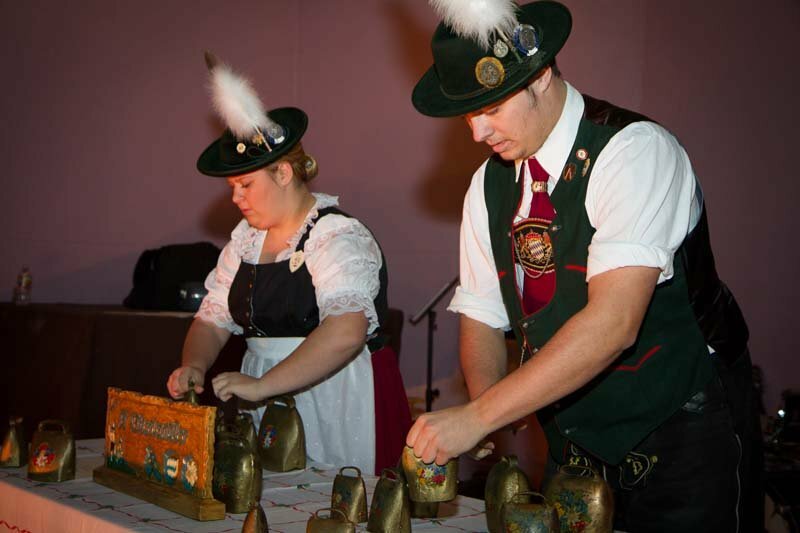 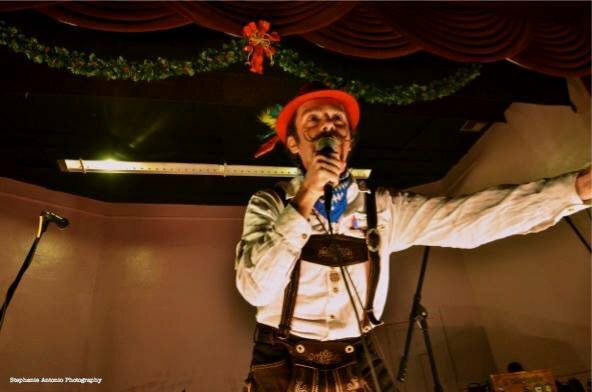 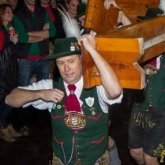 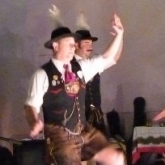 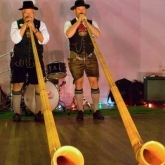 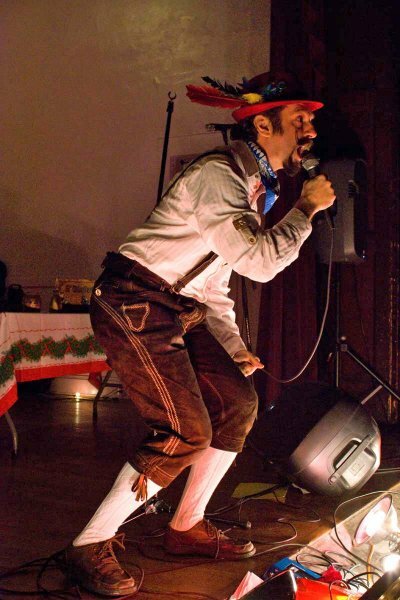 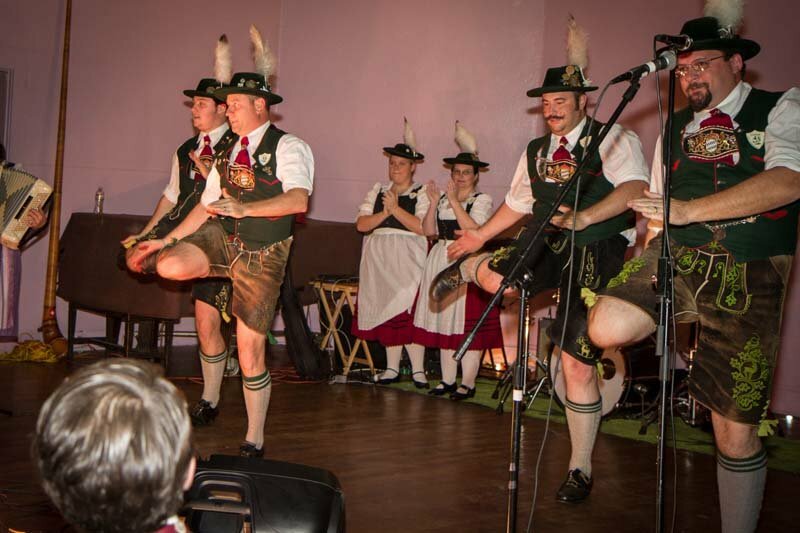 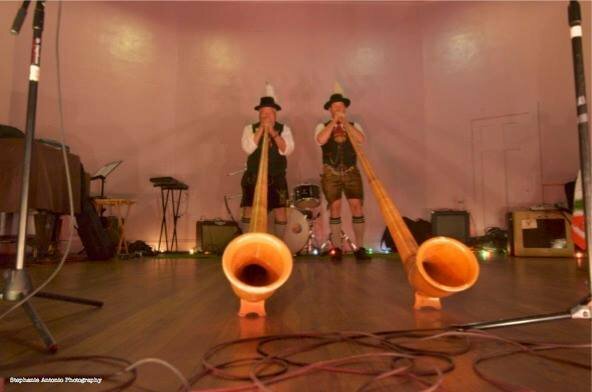 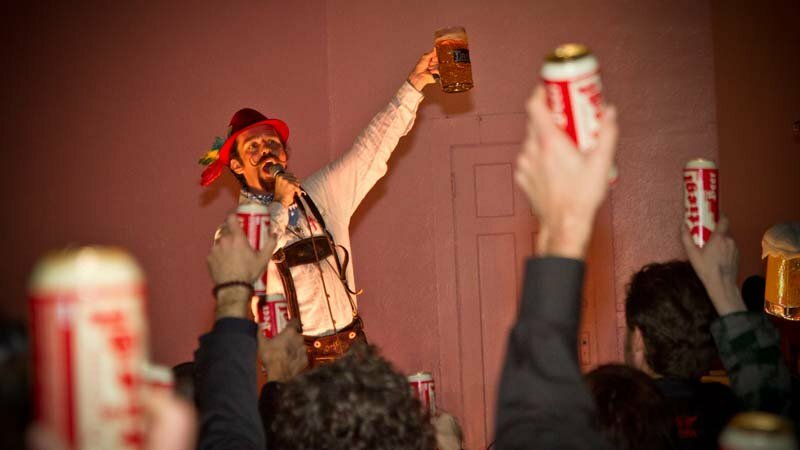 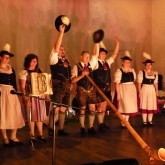 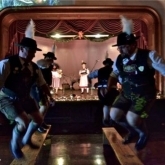 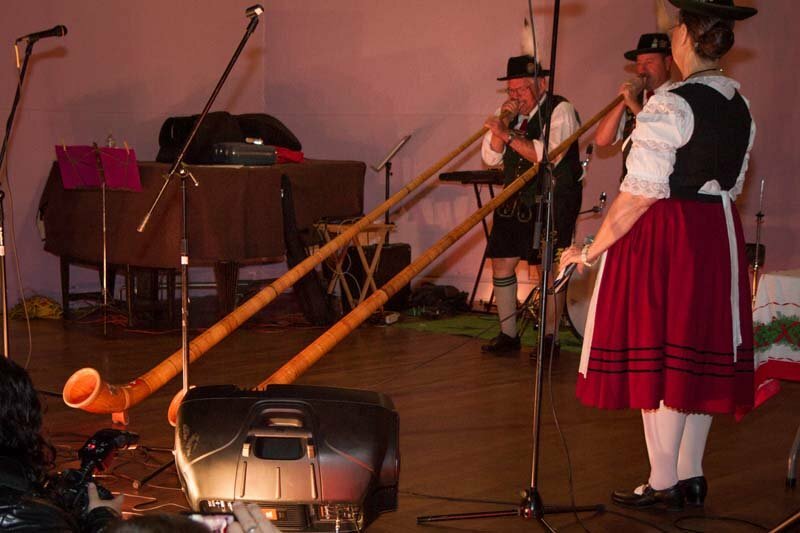 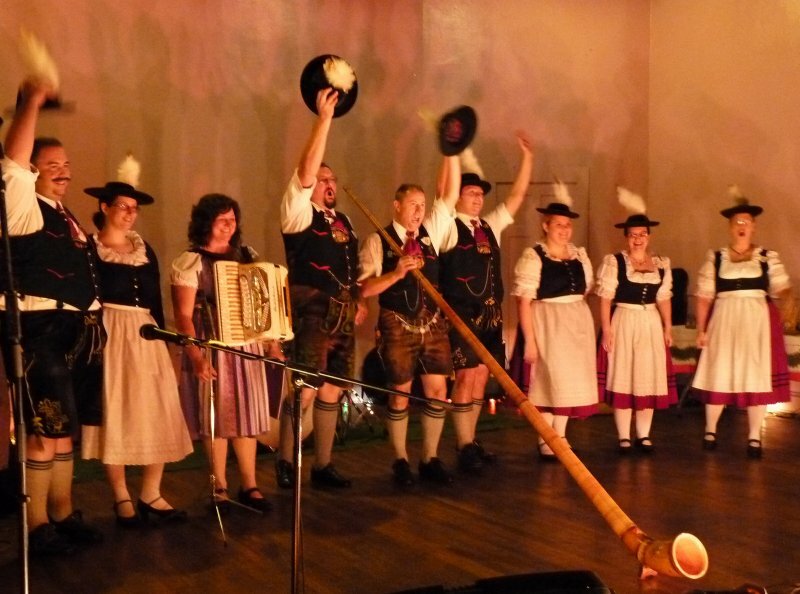 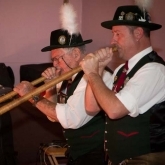 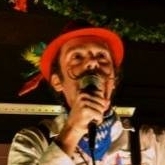 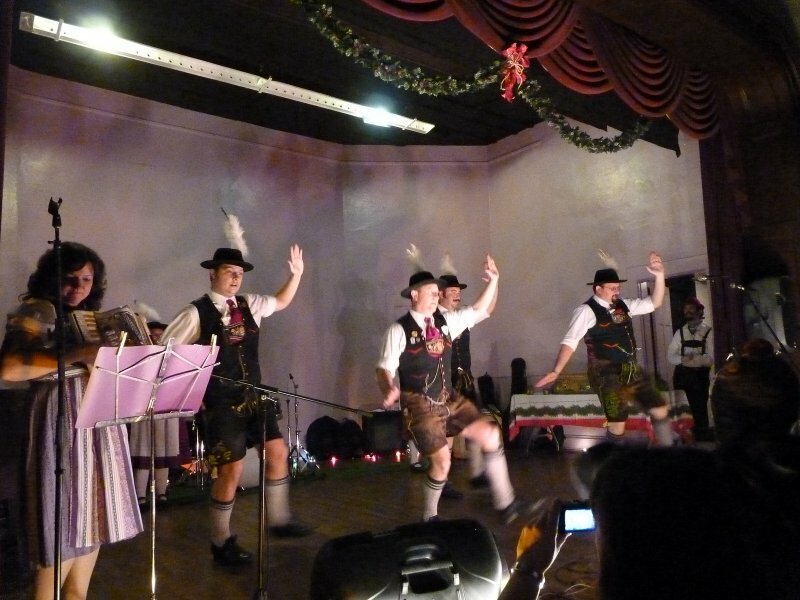 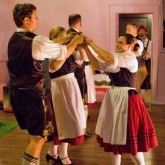 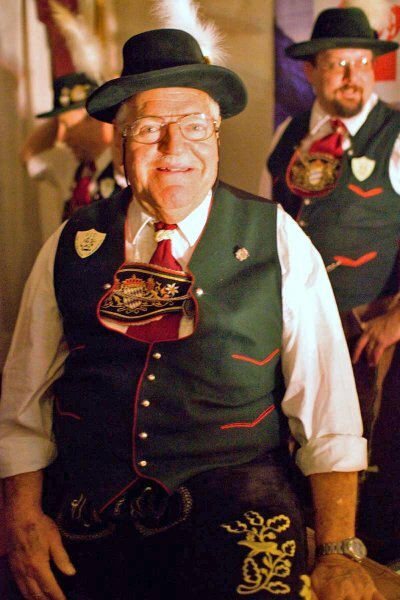 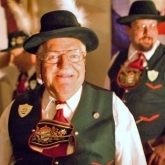 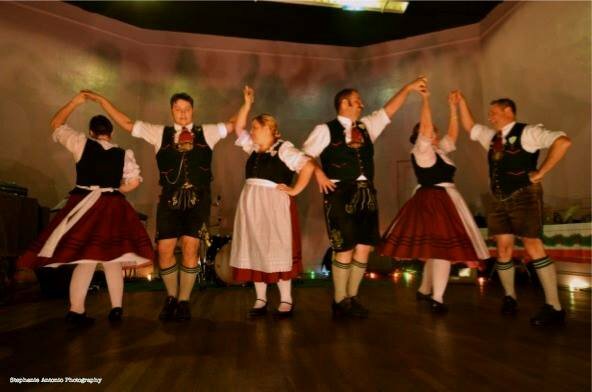 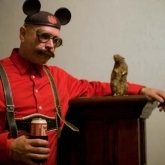 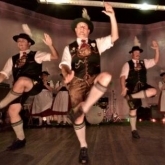 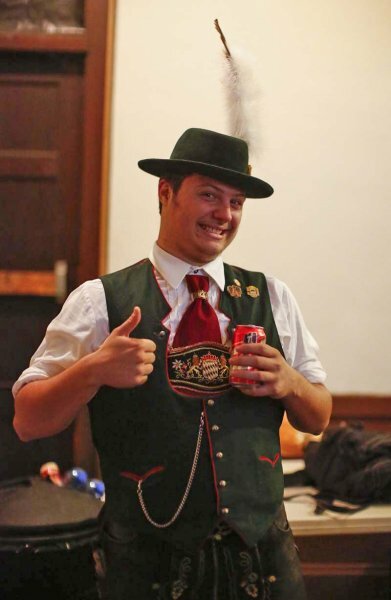 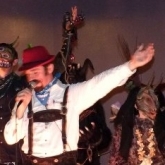 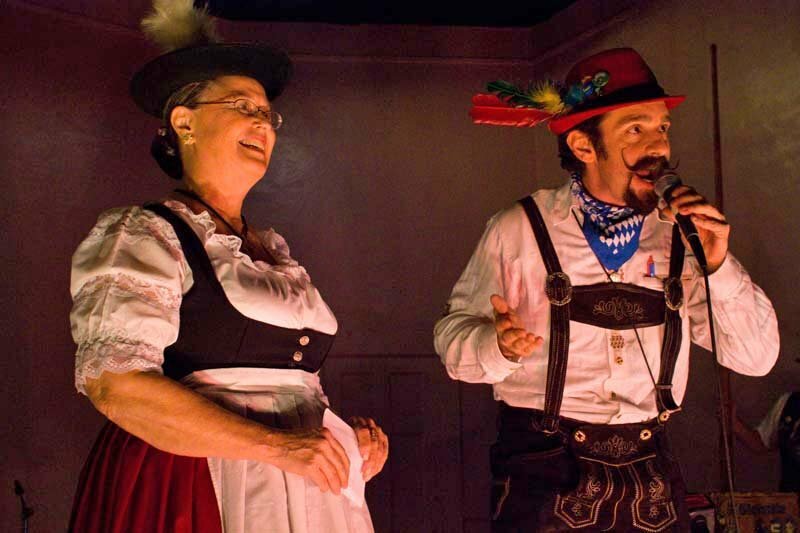 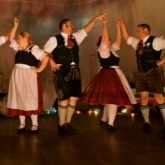 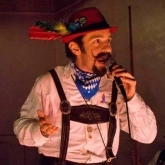 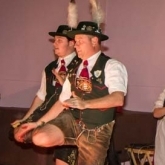 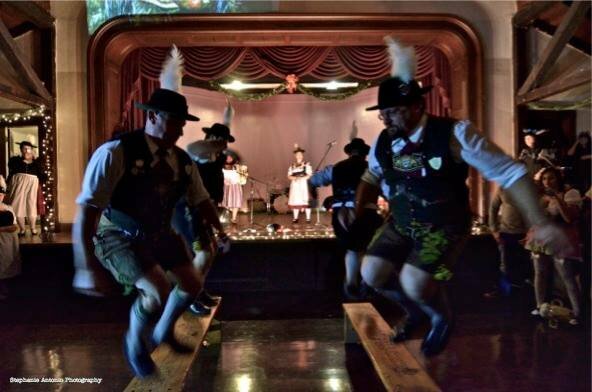 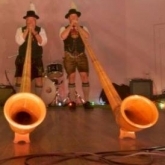 Onstage festivities began with FESTMEISTER HANS (Comedian and MC of Alpine Village’s Oktoberfest) introducing a set traditional Bavarian music and dance performed by G.T.E.V. 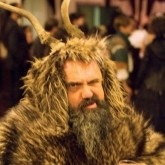 D’OBERLANDLER. 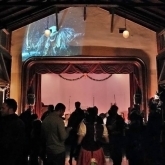 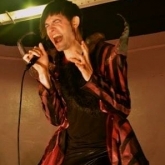 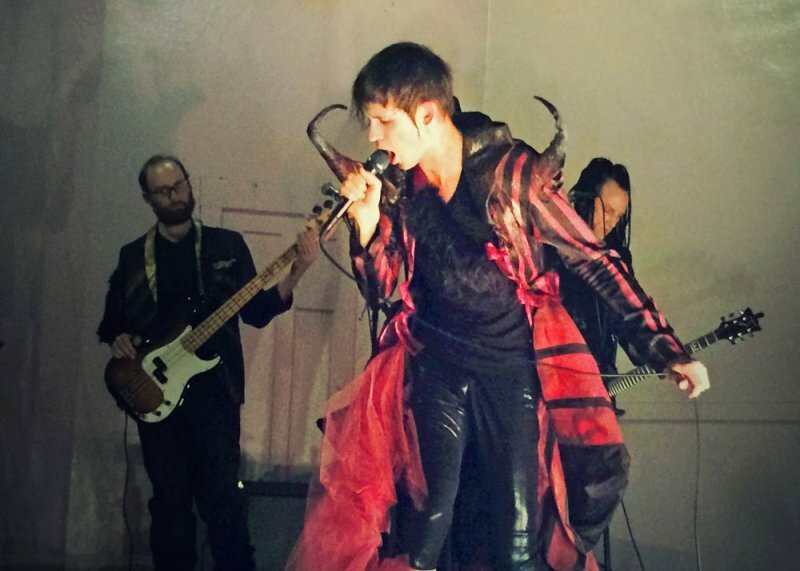 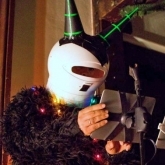 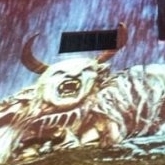 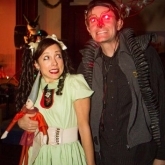 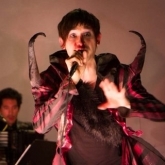 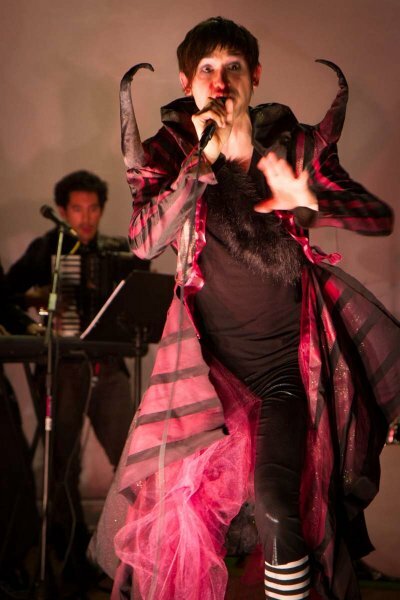 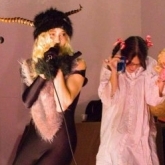 Other musical entertainments included the electronic manipulations of DJ KRAMPWERK (Ego Plum), ACTUALLY HUIZENGA performing her YouTube Hit “Here Comes Krampus,” the operatic glam-rock of SANTA KLAUS NOMI (Timur and the Dime Museum), featuring Nomi collaborator Kristian Hoffman and the burlesque theatrics of Prix de Beauté. 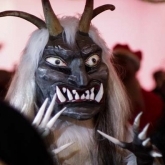 Festivities were interrupted as doors thrown open by a bell-clanging, switch-wielding swarm of frenzied devils from the KRAMPUS LA TROUPE. 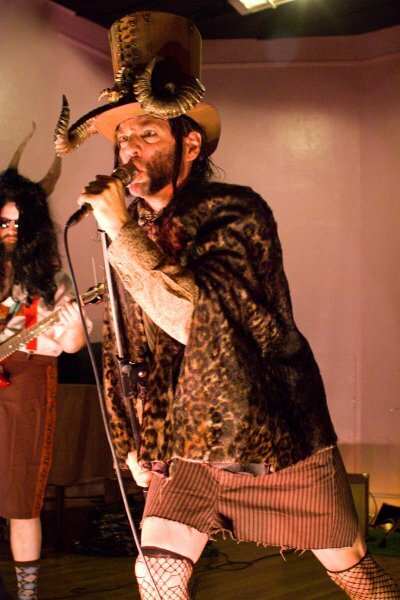 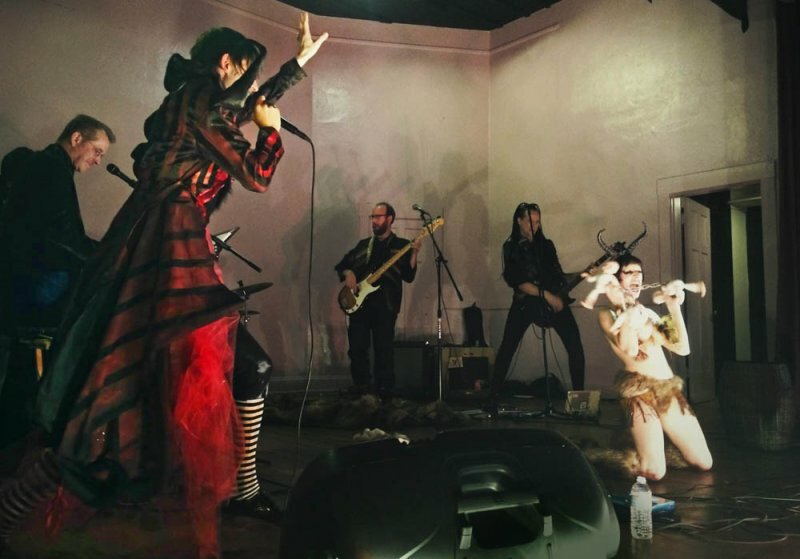 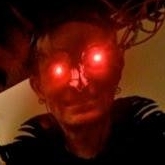 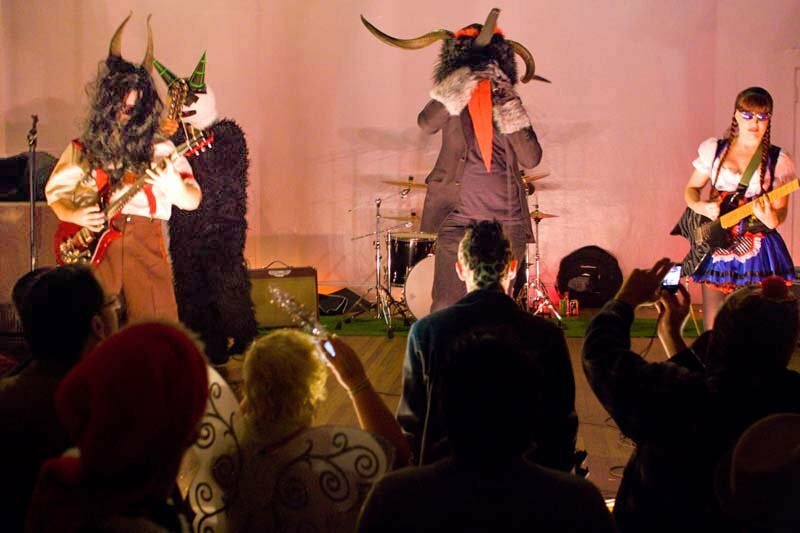 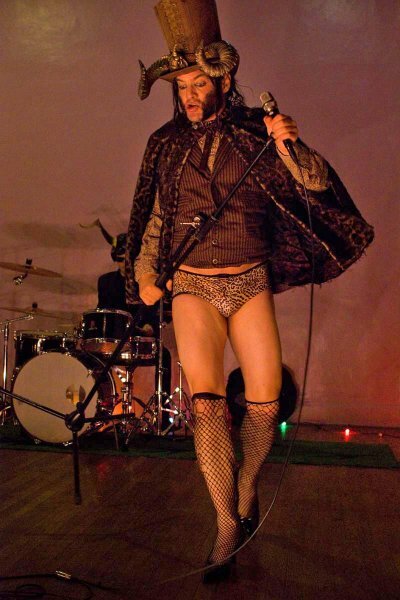 The crazed ruckus on the dance floor was quickly followed by the onstage frenzy of the evening’s final act: THE KRAMPS, featuring costumed members of The Radioactive Chicken Heads, Rosemary’s Billygoat and Haunted Garage channeling Lux and Ivy through howling Alpine devils. 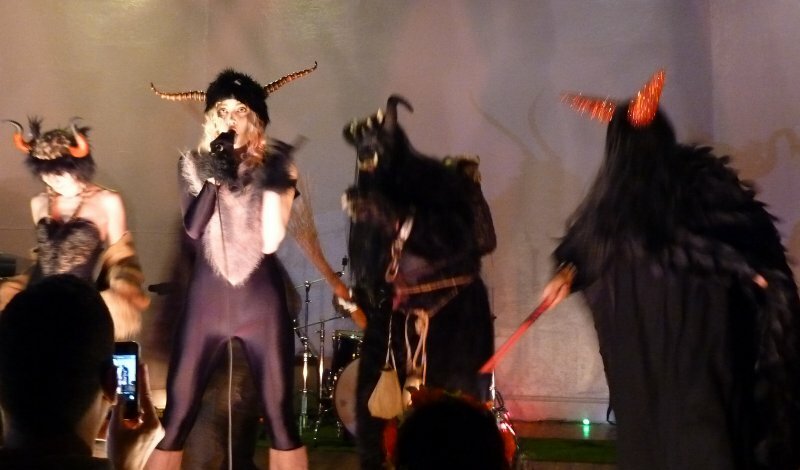 Read one reporter’s take on things at THE LOS ANGELES BEAT.